A Work Order is the central part of your business in Fieldwork. Invoices, commissions, billing frequency, scheduling and more come from what you enter in the Work Order. This article takes you through the basics of creating a Work Order. There are many places where you can create a Work Order. 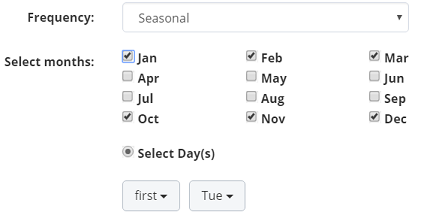 These steps start at the Customer page. In the upper-left corner of the Work Order you'll see the Billing Address and the Service Location. 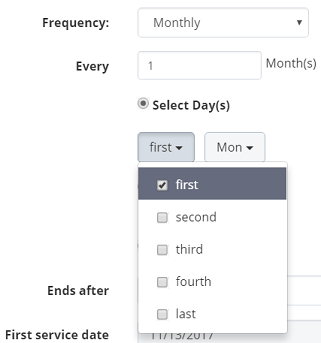 Note If the customer has multiple locations and you started from the wrong location, click the down arrow to the right of the location and make your location selection there. In the upper-right side of the Work Order you'll find the Load template button, Document Template (name), PO#, Start and End times. PO#: This is the Purchase Order number given to you by a commercial customer. It is used by companies that have many layers of bureaucracy to help keep track of and approve your Work Order and Invoice as it goes through the corporate levels. It moves the approval of payment more quickly through their systems. It's a good idea to keep the PO# in the Location Sticky Notes. Start and End time: When you complete the Work Order the Start and End times will change to reflect the actual times. 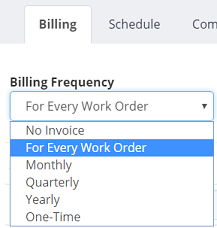 In the middle of the Work Order you'll see the row of tabs that pertain to the Work Order, including: Billing, Schedule, Commissions, Notes and PDF Forms. Services and Materials come from the Settings section of Services and Materials. Each of these is discussed later in this Getting Started Guide. 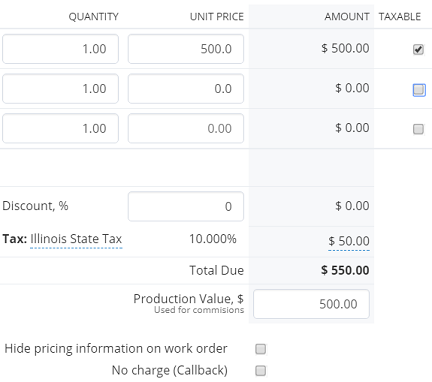 The bottom-right corner of the Work Order contains the pricing for the services and materials you've included in the Work Order. When you add a service or material the price for it comes from the Settings section of Services and Materials, which is where you add the price for it. 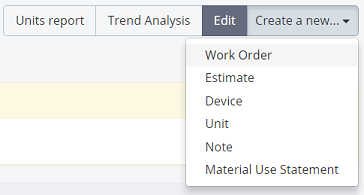 You can change the unit price in any Work Order. A note about 'inline labels': when you open a new Work Order you'll notice the Unit Price is $0.00 for the first service line. This is an inline label meant to guide you along to enter a price. Even if the service does not have a price, you still need to enter $0.00 to save the Work Order; otherwise, you'll see a pink Line items price is not a number error message. Taxable: If your state charges tax (for services or materials) click the Taxable check box accordingly. 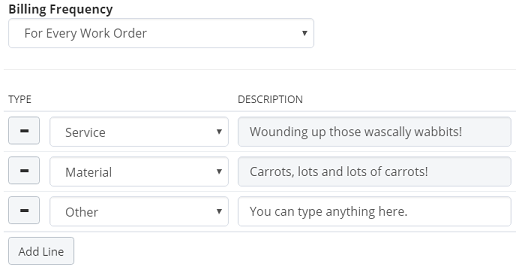 Note If you offer a flat-rate discount, add a line with Other as the type, and enter a description and a negative number (-25) in the Unit Price box to represent the flat-rate discount. When you create a new Work Order, if you have more than one technician, you'll see a rainbow bar with green on the left and blue on the right with your technician names in the bar. The tech on the left in the green shows you who will be closest to this location on any given day. This visual routing gives you an opportunity for you to let the customer know that you'll have someone in the neighborhood two days from now at 3 pm, for example. It can make your scheduling more efficient. 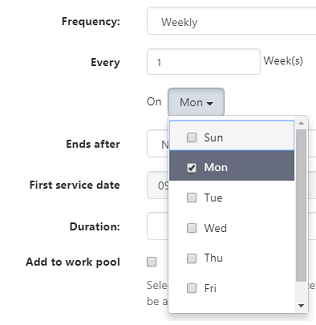 change from Wednesday to Thursday, you would change only that Work Order. This is explained in greater detail later. 5. Ends After: hopefully Never, which is good for your business! 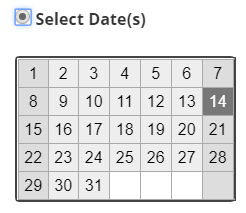 * Fixed number: ends after 2 visits, 10 visits? Service Date to be the third week on Wednesday. 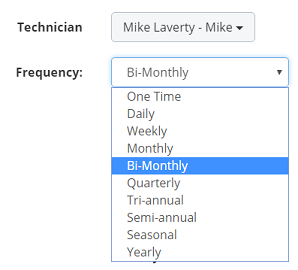 You can pick the person to receive a commission, assign sales and service role, select the commission type either as percentage or flat rate, the amount and give the commission an expiration date. The service and sales commissions are based on the total Production Value for the Work Order. The notes you type here appear in the Service Instructions in the mobile app (1st page). These instructions should outline the work to be done at the location. These instructions also appear in the mobile app once the tech is inside the Work Order in the Service Instructions section. These instructions appear in the Work Order it is created in only. Attach PDF forms to Work Orders to add additional reporting features, such as contracts, WDIRs, Notice of Pesticide Use, Waivers, Logs, and so forth. When a PDF form is attached to a Work Order, it becomes available in the mobile app. These forms can be edited from the mobile app, your customers and techs can sign them, and when the Work Order is completed and the tech emails the Work Order to the customer, the PDF file(s) will be included in the email.